Who lives in a pineapple under the sea? Absorbant and yellow and porous is he! And he's getting his very own MMOG! SPONGEBOB SQUAREPANTS! Nickelodeon has made a heap of money from Spongebob Squarepants, so it's no surprise that the company is always looking for new directions to market the character. Aside from the cartoon, film, amusement park ride, books, toys, clothes, and videogames, fans can now look forward to an MMOG set in Bikini Bottom. MTV Networks Asia has joined forces with Giga Media Limited to begin working on a Spongebob Squarepants MMOG that will be released sometime in 2011. However, Spongebob fans in North America and Europe are out of luck since the game is currently only coming to Asia. The game will launch in multiple languages, since its release is planned for China, Japan, Korea, Taiwan, India, and Southeast Asia. However, no further areas have been revealed, which is a little surprising since this is a property that is so manically popular in Western markets as well. The game is set to be a free-to-play MMOG, which means microtransactions will become a standard part of the play mechanics. 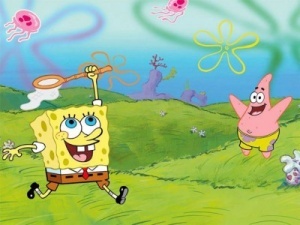 "The free-to-play model will offer an online store," MTV stated when it announced the game, "where users can purchase a range of bespoke items to populate and customize their experience, and will also feature a wide range of video and simple Flash-based games allowing users of all skill-levels and ages to interact and share their SpongeBob SquarePants experiences online." If the MMOG proves popular enough, there's always a possibility that Viacom (the parent company of Nickelodeon and MTV) might decide to bring the game to other markets. In the meantime, though, all parties involved with the title are keeping tight-lipped about further plans until its launch date is a little closer.